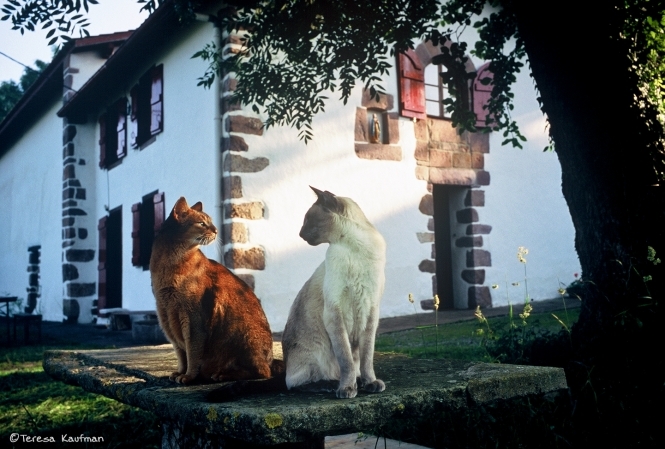 Walking in the countryside is one of life's big pleasures, but for some cat owners, it is not complete without feline company. Teresa Kaufman is one of them. She spent 18 years walking in the French countryside with her cats, because she did not like leaving them home alone. And she says that they made her see the country in a new light, with their eyes. 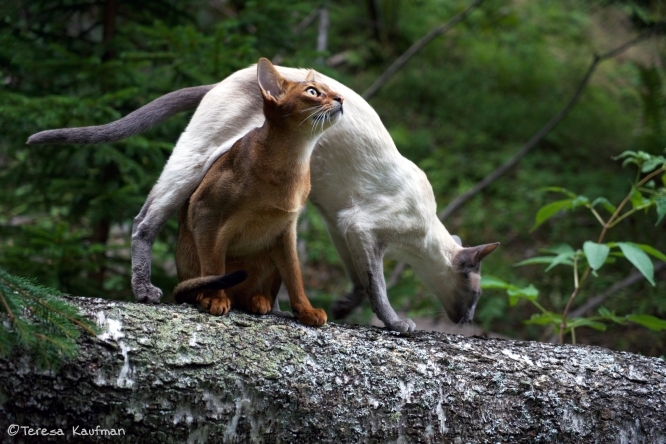 When she started exploring France on foot, she owned an Abyssinian called N'Arthur, and a Siamese called Jimmy. "I decided to take them with me, rather than worry about who was taking care of them while I was away," she says. Their first trip was not a success. The farmhouse she had rented was surrounded by motorways, making it difficult to let the cats out alone and almost impossible to take them on long walks. They have no collars and leads and do not follow Ms Kaufman like dogs, but bound ahead or loiter behind in their own time. They also need to be near trees or other shelter in case a cat-chasing dog should suddenly appear. "I like isolated places with plenty of open air, and no barriers. And whatever suited the cats suited me, because cats are so reactive to stressful situations." One favourite place was in the Cévennes near Le Pompidou, not far from Florac. "I found a great cottage to rent there where the cats would be happy." They had trained to walk with her from kittenhood and she planned her walks with the cats in mind. And she photographed them on their travels all over France. "It was an amazing experience because they showed me how to discover new things, and being with them taught me so much." 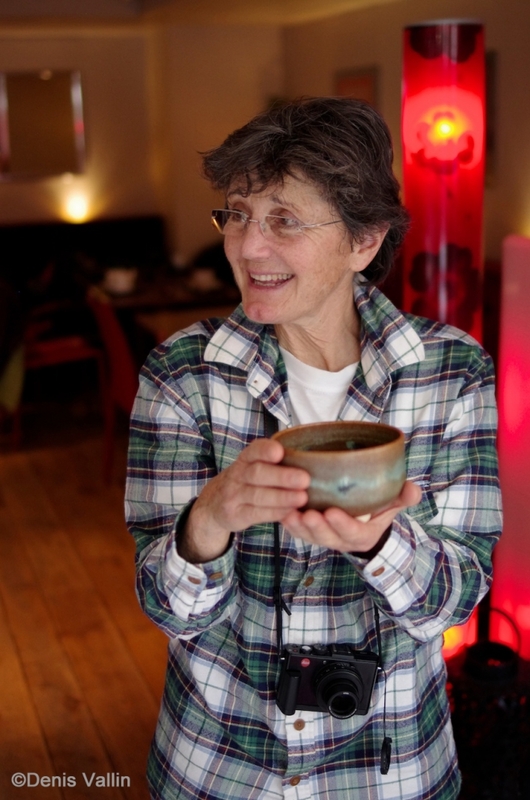 She says she learned to walk slowly, exploring everything around her and enjoying isolation. "The cats were like Geiger counters locating the golden spots filled with peace, serenity and tranquillity." Places the cats enjoyed most have become her favourite places and, today with two younger cats, she continues to travel. "The same scenarios continue, except this time, I already know which places work, and which do not." She has taken the cats to the Atlantic coast, the Basque country, the sandy beaches of the Gironde, the volcanic region of Cantal. In the Ardèche they stayed in a château. "And many times we travelled to the Luberon to hop through the lavender fields and run low to the ground in the grown wheat. "We also visited the prehistoric caves of Périgord. At least I did. They stayed at the campsite hunting wild rabbits." In the end, she says walking with her cats taught her how to make the most of the tiny good things: a ray of sun, a light breeze through a birch tree, the good smells of wet grass. "The cats also taught me to let go of stuff, of junk, the paraphernalia that crowds us and suffocates us as we go through life." 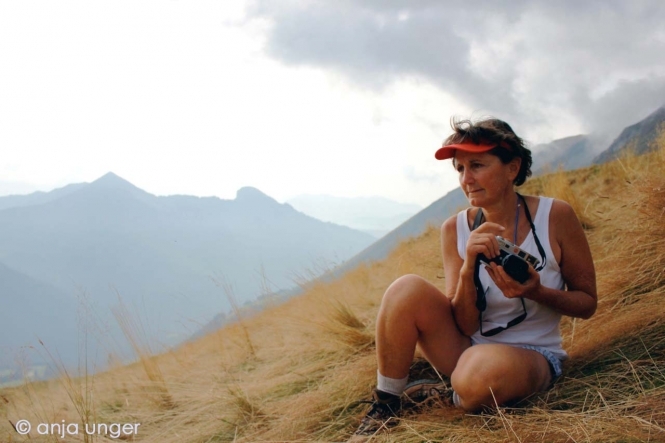 These days, her cats stay at home, but Teresa Kaufman (www.teresakaufman.com) still takes out guided walks, teaching people to see the mountains through the eyes of a cat.